Steve Trovato Essential Rhythm Guitar PDF + Mp3 CD download. Essential Rhythm Guitar: Patterns, Progressions and Techniques for All Styles. 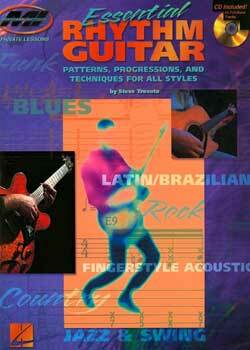 This book/CD pack is based on the concept that, for most popular music styles, there exist a few basic, fundamental rhythm guitar techniques and a set of appropriate chords and chord voicings that determine the sound of each style. This one-on-one lesson with MI instructor Steve Trovato teaches the rhythm guitar essentials for 7 styles: blues, rock, country, fingerstyle acoustic, Latin/Brazilian, jazz and swing, and funk. The CD features 65 full-band tracks. Includes standard notation & tab. If you want to just play rock, or just play blues, then this book will help you out… but if you want to get started in being a great all-around guitar player in any style then this book is the perfect way to get your foot through the door, and open your ear to new possibilities. The book is well organized, styles are well covered. You won’t become an expert in the forms but you’ll be able to noodle and have fun if you’re a beginner. Download Steve Trovato – Essential Rhythm Guitar PDF free and other books from our site. Only high quality PDF scans. Please write a review, it's important for our community.